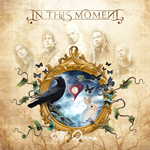 American band In This Moment was formed in 2005 as another 'melodic' metalcore (an oxymoron) outfit with the shrieks, grunts and growls delivered by female lead Maria Brink. Their debut work 'Beautiful Tragedy' garnered some well deserved attention but did not distinguish them from the host of other metalcore bands sucking the air out of this worn out and dismal genre. Whether this is the reason or simply that they wished to change creative directions, In This Moment has turned to melodic heavy metal as their new avenue of expression. Whatever the reason, it's a damn fine change for the better. The new course found on 'Dream' also proves three things: first, Ms. Brink can actually sing (Into The Light); second, Chris Howorth tears up the fret board with the best (Forever); and three, In This Moment may have found their true calling. However, don't expect, because they have a female lead and a return to melodic metal, you'll find goth metal here. (But they could have easily done so because that genre won't die either.) No, there is none of that astral, airy and symphonic stuff here. Sure their are keyboards, but this is straight up melodic metal. Songs like 'Forever,' 'All For You' and the brilliant 'Violet Skies' show that In This Moment can deliver catchy melodies, big choruses, and ripping guitar guaranteed to satisfy any melodic metal fan. If you think In This Moment forgot the 'heavy' than listen to 'Lost At Sea,' 'Mechanical Love,' 'Her Kiss' and, something of history, 'The Great Divide.' The latter draws you back into the best (and worst) of their old style with speed, thrash and dirty vocals. Honestly, this may be the only place that In This Moment fails. Otherwise, this is a well rounded and phenomenally enjoyable metal album. I was more than surprised; I was very impressed. Now if all the other metalcore bands would get the message.